Before I begin let me just say that it feels so good to be blogging again! Due to the crazy turn of events that happened in my life about a year ago, I had to shift all my attention away from blogging and focus in on growing my photography business full time. In the midst of all that blog silence I've been hiding behind a hustle curtain creating content for brands while occasionally capturing special moments for special people. Blogging has connected me with a wonderful community of like minded people who "get it" and who have supported me and given me confidence to pursue my dreams. It also brought me closer to few others who held my hand and dried my tears when I felt like my world was shattering- one of them being my dear friend and spiritual healer, Shayda. So when she called me several months ago to ask if I could film her intimate Chicago wedding it was without question I'd say yes! Fast forward to May and I'm on a 6am flight Chicago for the weekend. 3 days in the city, only 2 to get all the b-roll and instagrammable goodness I need to make this trip a success. I took a $40 uber ride from O'Hare to Public Hotel (which is now renamed Ambassador Chicago), located in a leafy part of Chicago's historic Gold Coast neighborhood. Upon check-in I was met with the stately interior that echoed 1930s Prohibition era swank- looked exactly like what I had envisioned if not better than what I saw in pictures. You can almost hear Frank Sinatra and all the iconic history that lives within the hotel walls. It was heaven. Once I got over taking pictures of the empty lobby I made my way into the elevator and up to my room. I slid my key card against the reader and-- if I should be quite honest it felt a bit barren & underwhelming compared to what I had seen in pictures. Still nice & cozy but lacked little details to personalize guest experience- just 'meh' compared to the stately interior I had just witnessed downstairs. Once I got myself acquainted I decided to pack up & explore the neighborhood to get some b-roll for the wedding. But first, of course, was coffee. Just a short walk down State Street I headed towards The Freehand Chicago, home to nomadic hipsters and infinite amounts of avocado toast. My two cents: great casual place to enjoy a morning coffee or light breakfast. The laidback atmosphere in the dimly lit lobby makes it hard not to want to sit & lounge for a while. As I looked outside the window while finishing the last of my chia pudding it started to pour. I had already been sick and figured it wasn't worth getting worse a day before the wedding, so I rushed back to my hotel room & spent the rest of my day editing in bed. When it was just about time for dinner I took a short walk down the street to the 3 Arts Cafe at Restoration Hardware. You can't leave Chicago without coming here. 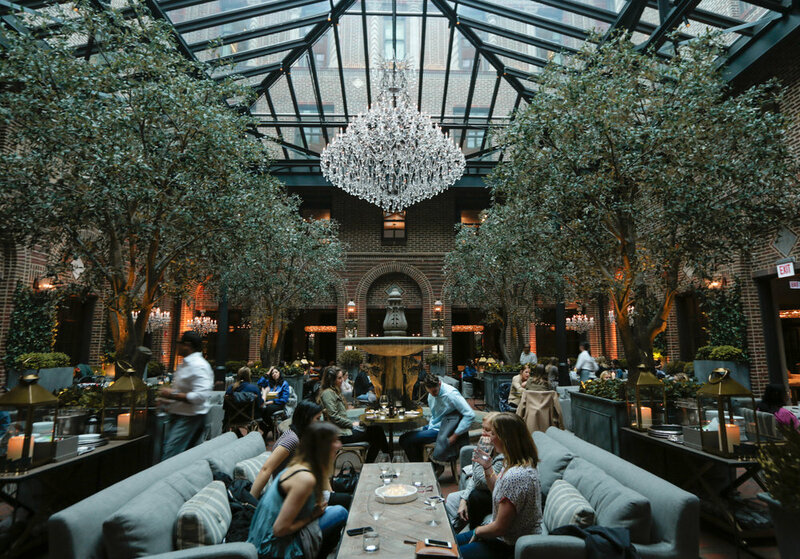 Besides the fact that the interior is absolutely gorgeous with its high glass ceilings & huge chandeliers, it's perfect to stop by during almost any time of day- combing needs of a coffee house, wine bar & restaurant all in one place. Believe it or not the rest of the trip I was consumed with filming my friends wedding up until 5am that morning when I had to catch my flight back home to Miami. The stormy, cold weather conditions + me being sick already didn't breed ideal conditions to walk the city and shoot for fun. I did however manage to catch a bite with the bridesmaids & the beautiful bride on our night out before the wedding at the bustling neighborhood of Fulton Market. Not sure why I had never heard of this area before especially after coming to Chicago quite a few times prior but damn I was missing out. Please do yourself a favor and cross the river to explore all the culinary & artisan wonders on or near Randolph St.
As soon as we arrived I immediately noticed the industrial grit & faded brick buildings that made this place so charming. If you know me well you know that's totally my vibe, so needless to say I was in heaven. Things got even better when we walked down a cobblestone alleyway and saw a sign that said "RM Champagne Salon". We were going to a freaking hidden a champagne bar. Their focus is on champagne & the chef is French. I don't need to go into detail about the obvious experience I had. Just go there. Once pre dinner cocktails & appetizers were up we walked around the corner to The Girl & the Goat, a busy restaurant apparently super hard to get reservations due to popularity both among locals & out of town visitors. Stephanie Izard, the brainchild of this place won Top Chef in Season 4. We ordered almost everything on the menu. I can't speak for the meat dishes but the fish & veggie dishes were out of this world. The pan seared sea bass was one of my personal favorites. Annnnnd just as abruptly I left Chicago is how I'm going to end this post. Although it was a short trip and I was sick for most of it I was happy with how much I was able to do and even happier be a part of my dear friend Shayda's special day. If any of you have any other recommendations in the city feel free to leave them in the comments!